I know this film has been getting a lot of backlash, and I guess I can kind of see why. But I really enjoyed it. And anyway, I'm not here to conjecture about other opinions. I'm here to give my own. I thought it was a lot of fun, nicely silly, and really beautiful to watch. I think maybe people expected the next Lord of the Rings movie, but The Hobbit is not The Lord of the Rings. The original book has an entirely different tone--it's a kid's book, for Christmas sake! I admit I haven't read the book (nor seen the Rankin/Bass animated movie) for over 20 years, but as I remember it, it's a funny bunch of dwarves get captured, Bilbo and/or Gandalf saves them. Repeat. And repeat. Some silly songs, some exciting action, brush the dust off your britches and off we go! But I'm also not here to review a book or a 35-year-old movie. I'm here to review a brand-new movie. And this brand-new movie is a funny bunch of dwarves get captured, Bilbo and/or Gandalf saves them. Repeat. And repeat. Some silly songs, some exciting action, brush the dust off your britches and off we go! What can I say? I had fun! I really enjoyed being in this world and traveling around with this weird bunch of folks. Some things were much less successful than others. Some things were probably just bad ideas, like Radagast's rabbit sled. I could tell at times that Peter Jackson was kind of trying to solemnize the proceedings to make this movie not such a jarring change in tone from the extremely heavy and dark LoTR movies. At times it worked and at times it was a little annoying because I was enjoying having so much fun and you're kinda bringing me down, man. When I originally heard they were re-casting Ian Holm with a younger actor I was kind of upset, because who could do a better job than Ian Holm? Then I heard they cast Martin Freeman, and I thought, "Oh, right. Yeah, that works." I thought he did an excellent job with the character. He's put-upon, put-down, and harried, but still manages to be extremely likeable. It helps that he's very clever and very self-effacing and polite, even in the face of extreme danger. Even when he's frantic or should be going insane with fear, he has this strange, matter-of-factness about him that is very funny and very British. Like when he's about to engage in the riddle game with Gollum, he learns that if he loses Gollum will eat him whole. This is a life or death situation! But he just thinks about it for a second, kinda shrugs and says, â€œFair enough.â€� It works as a good laugh, but it is also very revealing of his character. 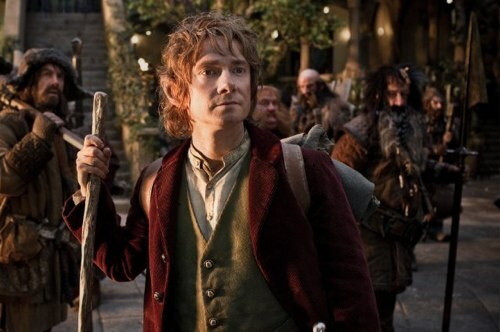 Bilbo is the kind of guy who succeeds because he just kind of goes with the flow. Even if he may protest and stammer quite a bit, in the end he slips around obstacles like water instead of bumping headlong into them like the dwarves and (to a certain extent) Gandalf do. This brings me to one thing that I found very surprising about The Hobbit: it is a very, very, very British movie. In LoTR (almost) everyone had British accents, of course, but the movie felt very American in its sensibilities and humor. But this one feels just so... British. Trolls and Goblins speak with lower-class British accents. Bilbo is prickly and prim even in danger. Everyone is just so how they are and this is all quite the sticky wicket, eh wot? Chip-chip! A lot of this movie had that same kind of feel I get when watching wacky British adventure shows like The Avengers. And seeing as how The Avengers is my all-time favorite TV show, maybe that explains why I like The Hobbit when so many other people didn't. And I know people are complaining about how long of a movie it is, but a lot happens in it! Frankly I was surprised they got as far in the story as they did! And I was never bored, even on some of the longer tangents (like The Adventures of Radagast, or The White Council Meeting). And even in some of the slower moments, there was so much beauty on the screen at which to marvel. I thought the LoTR movies were very pretty, but often they got bogged down in ugly locations (like pretty much the last half of Sam & Frodo's journey) that weren't that much fun to look at. But it seemed like Peter Jackson really upped the beautification of Middle-Earth in this one. Even places like the Goblin City were full of fun and fascinating details and good color choices. Oh, and also the Wargs look about a million times better in this movie than they did in the LoTR movies. Those were pretty bad, actually. But I must say the best special effect in the entire movie had to have been the fact that there are a bunch of actors who were in LoTR, and here they are 10 years later and they look exactly the same. I really do wonder if there was some kind of digital special effect involved (like what they used in a flashback in X-Men: The Last Stand) or if it was just makeup and generous lighting. Anyway. The Hobbit isn't as brilliant as the LoTR movies, and I freely admit that, But that doesn't mean it is in any way a terrible movie. Three stars is still pretty good! *Full disclosure: I saw The Hobbit in 2D at 24 frames per second.